“Z For Zachariah” is a frustrating post-apocalyptic drama. 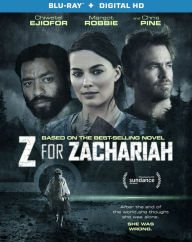 “Z For Zachariah” begins by introducing viewers to a religious woman (Anne) who is living alone with her dog in a radiation free valley. Shortly thereafter, she meets a survivor (a brainy civil contractor named John). Considering no one else is around, Anne and John begin to bond, but things become complicated when another man enters the picture (a former miner named Caleb). While they all get along at times, there is jealousy brewing between Caleb and John over Anne. “Z For Zachariah” is not what you would expect from a post-apocalyptic drama. It’s a surprisingly slow paced, but intimate drama that is decidedly character driven. While this enables screenwriter Nissar Modi to explore themes and ideas such as trust, survival, romance, humanity, and jealousy, the movie frustratingly builds up to an open ending. Personally, I’m getting rather tired of this storytelling trend. While it is effective in certain instances, it often feels lazy in that the writer is telling an incomplete story. It most certainly does not fit the story here. On the bright side, the lone cast members (Chris Pine, Chewitel Ejiofor, and Margot Robie) are all fantastic in their roles. You are truly watching A-Listers at the top of their game. I only wish they had a better script to work with. Presentation: 2.40:1 1080p. How does it look? The hi-def transfer is superb. The exterior locations are breathtaking in 1080p. Audio Track: 5.1 DTS-HD MA. How does it sound? The track is effective even during the quieter moments. * Lionsgate trailers and a “Z For Zachariah” trailer. * Interviews with Craig Zobel, Margot Robbie, Chiwetel Ejiofor, and Nissar Modi. * “The Making of Z For Zachariah” contains film clips, interviews, character and story discussions, you know the drill.